Image-Line Software Image Line FL Studio Signature Bundle Edition 11 FL Studio 11 (Fruity Loops) is a complete software music production environment with everything you need in one package to compose, arrange, record, edit, mix, master and perform professional quality music. Now includes live Performance Mode and multitouch support. 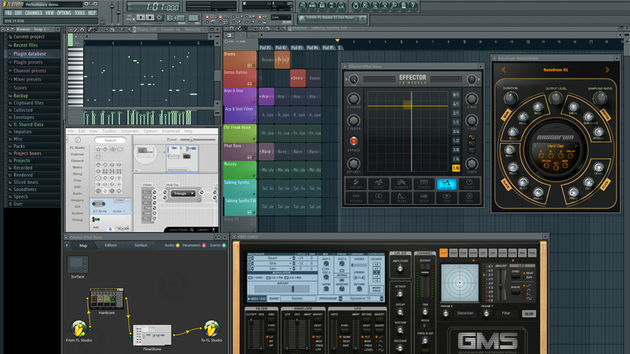 FL Studio comes with 3 brand new plugins: BassDrum, GMS (Groove Machine Synth), and Effector with 12 performance oriented effects with x/y controls. Updated plugins for this release include Patcher, VFX Key Mapper, VFX Color Mapper, Harmor, ZGameEditor Visualizer, and DirectWave. Get the demo for FL Studio 11 now! Download FL Studio 11 Demo After you download the demo, download some of our free fruity loops to try with FL Studio! Spectrasonics Omnisphere provides over 40GB of core sounds that can be used as the basis to mangle or refine any specific sound you like. Omnisphere uses a pioneering Composite Morphing Technique to generate harmonic resonances that you normally lose from traditional sampling instruments. This power synth breaks completely new sonic ground by combining a wide variety of hybrid realtime synthesis techniques, an epic library of remarkable 'Psychoacoustic' sounds, and many innovative features that have never been seen before in any hardware or software synthesizer. Omnisphere was made from expert synthesists and the most advanced sound designers. Users can go deeper and deeper into the software and progress in their synthesis knowledge by simply exploring additional levels of sound manipulation options. Omnisphere offers a host of hybrid synthesis and new control capabilities including Variable Waveshaping DSP synthesis, Granular synthesis, Timbre Shifting, FM, polyphonic Ring Modulation, high-resolution streaming Sample Playback, Harmonia(TM), Dual Multimode Filter structure, Chaos Envelopes(TM), an advanced Unison mode, and the innovative Flex-Mod(TM) modulation routing system - to name a few. Trilian is Spectrasonics successor to their award-winning Trilogy bass instrument and is designed to be the most multi-faceted virtual instrument for acoustic and electric basses. It also features cutting-edge synth bass tones, powerful editing and excellent sound quality. Trilian's 34GB library is 10-times the size of Trilogy and offers deeper control of musical expression and greater flexibility of sound shaping. Over sixty electric basses are presented in fretless, slapped, tapped, fingered, picked and muted technique variations. Trilian features newly-developed 4-Pole filter algorithms with oscillating resonance which are perfect for electronic bass. Synth soundsources were created using over 30 hardware synthesizers - from the original Moog(R) Taurus Pedals to the latest boutique analog modular synthesizers. A multitude of powerful editing controls are available for sound design. Most musicians envision music as a structure broken down to intro, verse, chorus, solo, breakdown and outro. Propellerhead has addressed this in Record by using what they refer to as "Blocks". Simply create your patterns using a huge amount of racks, reverbs, distortion units and other effects to add character to your sound. You can sequence your track using these "blocks" as the building blocks. You can then change to "Song Mode" and paste your blocks in into a full composition with ease. If you know Reason then you know that Propellerhead excells at best utilizing your computers cpu resources. Record has a very flexible time stretch that lets you change tempo on all your audio tracks without the need for processing. It comes with Line 6 guitar amp, cabinets and effects as well as the new Neptune voice synth that will create new harmonies from vocal tracks! Record is extremely simple and very creative. The mixing console is based off the amazing SSL 9000k analog mixing desk. Record comes with multi-core support and runs at 64 bit for a huge studio sound. Record is an amazing DAW focusing on creativity and inspiration and is definitely worth checking out. Ableton Live is excellent for when you need inspiration for a new track. The effects in Ableton Live are great and fun to tweak in realtime thanks to knob assignments to hardware. Assigning hardware to the knobs is not required for detailed envelopes and motion but it's extremely useful for live performance. Ableton has the interface for Live laid out in a logical manner. The style of interface is however very different from what many veteran DAW users might be used to. If you are just getting into music production however, it is a fun way to learn looping, effects and composition in a creative way. Another exceptional function is Abletons looping abilities. The time stretching algorithm sounds great and has more options than I have space here to describe. Definitely check out the Ableton Live demo and see how it helps your inspiration for music production. Nexus 2 is one of those VST synths that will surprise you when you first hear it. It has a beautiful arrangement of presets and a wide variety of expansion packs covering several electronic styles of music. While listening to the presets in the video you might notice that many to most of the sounds are multilayered and usually consist of a pad. While this makes many of the presets sound lovely it also distracts from hearing the quality of the single patch sounds on their own. The sounds can of course be edited but because Nexus 2 is a ROMpler the level of editing is not going to be nearly in depth as a vst synthesizer using an actual synth engine. There is a loudness war going on and limiters and maximizers are the weapons of the battlefield. To produce music that can compete with the volume of other top hits these days they're almost required. I've tried numerous software limiters and maximizers and one of my favorites is the Wave Arts Final Plug. Many limiters have a harsh quality they add to the audio but Final Plug creates a threshold for peaks and adds a solid increase of volume while remaining fairly transparent. Check out the Final Plug Demo and see what it does for your mix.